Miller Row is a unique twist on the Seattle infill lot. The south property boundary is shared with a neighborhood park, effectively creating rowhouses on the park. Five homes in two structures step down the hill and engage the adjacent park directly. A common walkway along the boundary shared with the park to the south provides access to front porches for each home and a shared courtyard between the two structures. One structure of four homes is pushed close to the street, referencing the position of its neighboring structure. The other structure, a single-family home, is pushed towards the rear of the lot. 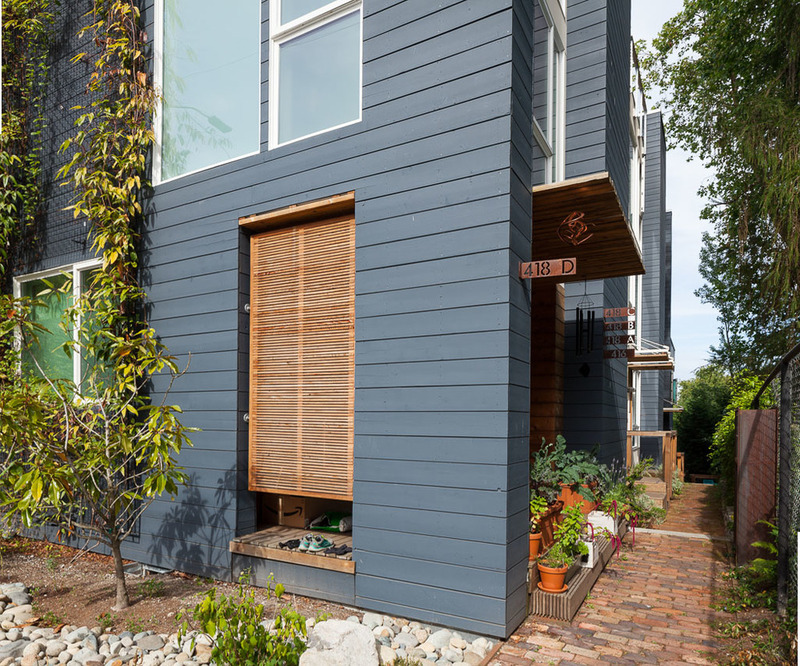 At two-stories this home provides a transition to the less intensive zone across the alley at the project's rear. The project is designed to have large windows facing south for passive solar and visual access to the adjacent park. Materials include accents of sustainable hardwood at unit entries and a reclaimed brick walkway.